OBJECTIVE: To determine if esophageal manometry added information important for preoperative fundoplication planning compared to upper GI contrast studies (UGIS) METHODS: We retrospectively reviewed the records of 323 patients at a single institution who underwent a fundoplication (Nissen or Toupet) for GERD and/or paraesophageal hernia from 2003 to 2007. Of these, we excluded patients younger than 18 or who underwent re-operation. 40 patients had complete results of both esophageal manometry and upper GI contrast study. UGIS were performed with liquid barium and/or barium-coated marshmallows and included information about gastric function. Esophageal manometry was performed with a solid state 5-channel probe.RESULTS: 10 patients (25%) had varying degrees of dysmotility on UGIS. Of these 10, 7 had normal manometry, 2 had ineffective esophageal motility (IEM), and 1 had nutcracker esophagus. Only 1/10 of these UGIS demonstrated delay in bolus transport with normal manometry, and underwent partial fundoplication. In manometric studies, 29 (73%) had normal motility. 11(27%) had dysmotility(2-nutcracker; 9-IEM). All with manometric dysmotility had normal bolus transport on UGIS, and only 3 had mention of some dysmotility. All 11 patients underwent Nissen fundoplication. Gastric motility and emptying were specifically mentioned in 33 patients (83%), and there were no patients with gastric outlet obstruction or aperistaltic stomach. CONCLUSION: Manometry is often considered most important for preoperative planning in fundoplication. However, UGIS can provide adequate information about esophageal motility and bolus transport. Additionally, UGIS adds information regarding anatomy, gastric motility, and gastric outlet obstruction. 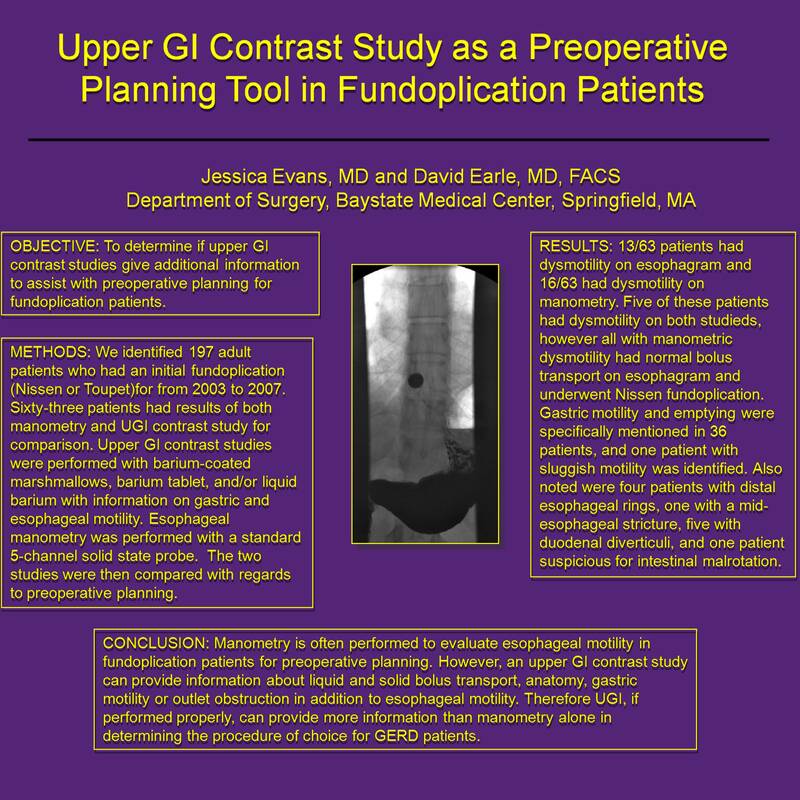 Therefore UGIS, if performed properly, is the most important study for preoperative fundoplication planning. However, it is probably still important to obtain baseline manometry information preoperatively.